She also described how one of her two school friends that had left the UK with her had died in a bombing. The fate of the third girl is unclear. After the caliphate: Has IS been defeated? Bethnal Green Academy pupils Ms Begum and Amira Abase were both 15, while Kadiza Sultana was 16, when they left the UK in February 2015. They flew from Gatwick Airport to Turkey after telling their parents they were going out for the day. They later crossed the border into Syria. After arriving in Raqqa, she stayed at a house with other newly arrived brides-to-be, she told the Times. "I applied to marry an English-speaking fighter between 20 and 25 years old," she said. Ten days later she married a 27-year-old Dutch man who had converted to Islam. She has been with him since then, and the couple escaped from Baghuz - the group's last territory in eastern Syria - two weeks ago. Her husband surrendered to a group of Syrian fighters as they left, and she is now one of 39,000 people in a refugee camp in northern Syria. Asked by Times journalist Anthony Loyd whether her experiences of living in the one-time IS stronghold of Raqqa had lived up to her aspirations, Ms Begum said: "Yes, it did. It was like a normal life. The life that they show on the propaganda videos - it's a normal life. "Every now and then there are bombs and stuff. But other than that..."
She said that seeing her first "severed head" in a bin "didn't faze me at all". "It was from a captured fighter seized on the battlefield, an enemy of Islam. "I thought only of what he would have done to a Muslim woman if he had the chance," she said. "I'm not the same silly little 15-year-old schoolgirl who ran away from Bethnal Green four years ago," she told Mr Loyd. "I don't regret coming here." 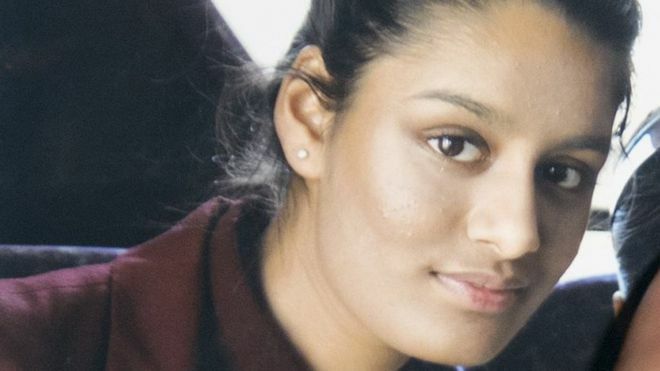 Will Shamima Begum be allowed to return to UK? Shamima Begum was legally a child when she pinned her colours to the Islamic State mast. And if she were still under 18 years old, the government would have a duty to take her and her unborn child's "best interests" into account in deciding what to do next. But she's now an apparently unrepentant adult - and that means she would have to account for her decisions, even if her journey is a story of grooming and abuse. 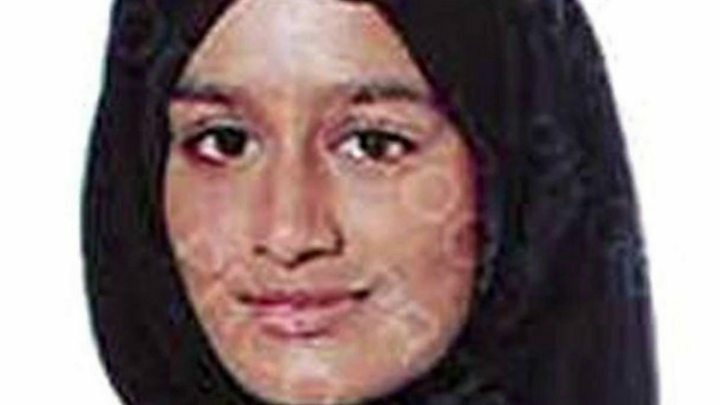 Another British jihadi bride, Tareena Shakil, who got out of the war zone with her child, lied to the security services on her return and was jailed for membership of a terrorist group. If Ms Begum got out of the country, that is the kind of charge she could face - along with encouraging or supporting terrorism. But that's a long way off. Assuming she made it to an airport, the UK could temporarily ban her from returning until she agreed to be investigated, monitored and deradicalised. Social services would also certainly step in to consider whether her child should be removed to protect him or her from radicalisation. But Ms Begum said the "oppression" had come as a "shock" and said she felt the IS "caliphate" was at an end. "I don't have high hopes. They are just getting smaller and smaller," she said. "And there is so much oppression and corruption going on that I don't really think they deserve victory." She referred to her husband having been held in a prison where men were tortured. A lawyer for the family of Kadiza Sultana said in 2016 that she was believed to have been killed in a Russian air strike. Ms Begum told the Times her friend had died in a bombing on a house where there was "some secret stuff going on" underground. She added: "I never thought it would happen. At first I was in denial. Because I always thought if we got killed, we'd get killed together." Ms Begum said losing two children "came as a shock. It just came out of nowhere, it was so hard". Her first child, a girl, died at the age of one year and nine months, and was buried in Baghuz a month ago. Her second child - the first to die - died three months ago at the age of eight months, of an illness that was compounded by malnutrition, the Times reports. She told the paper she took him to a hospital. "There were no drugs available, and not enough medical staff," she said. As a result she said she was "really overprotective" of her unborn child. She said this concern also contributed to her decision to leave Baghuz. "I was weak," she said. "I could not endure the suffering and hardship that staying on the battlefield involved. "But I was also frightened that the child I am about to give birth to would die like my other children if I stayed on." She said she remained scared her unborn baby would become ill in the refugee camp. "That's why I really want to get back to Britain because I know it will be taken care of - health-wise, at least," she said. She said she should be giving birth "any day now". "I'll do anything required just to be able to come home and live quietly with my child." Tasnime Akunjee, a lawyer who was instructed by the Bethnal Green girls' families after they ran away, said the families had told him they now wanted "time and space to process what's happened". Security minister Ben Wallace said he could not comment on Ms Begum's case for legal reasons but said any Britons who had gone to Syria to engage or support terrorist activities should be prepared to be questioned, investigated and potentially prosecuted if they came back to the UK. He said there was no consular assistance in Syria so any Briton wanting help would need to find consular services elsewhere in the region. Asked whether the government would be rushing to bring home people such as Ms Begum, he said: "I'm not putting at risk British people's lives to go and look for terrorists or former terrorists in a failed state." He added that while the UK had a duty of care to children of Britons in Syria, he also had a duty towards all UK citizens and would do what was "proportionate and necessary" to keep people safe. Sir Peter Fahy, a retired senior police chief who led the Prevent terrorism prevention programme at the time the girls ran away, said he could understand why the government was "not particularly interested" in facilitating her return. "If the woman was showing complete remorse, it would be completely different," he told BBC Radio 4's Today programme. It would cost a "vast amount of money" and the biggest challenge would be for local police to keep her safe and ensure she did not become a lightning rod for both right-wing extremists and Islamic extremists, he added. Dal Babu, a former Metropolitan Police Chief Superintendent, said it should be remembered that Ms Begum was groomed as a child to become a radicalised woman and was a "victim of brainwashing". IS has lost control of most of the territory it overran, including its strongholds of Mosul, in Iraq, and Raqqa, in Syria. However, fighting continues in north-eastern Syria, where the Kurdish-led Syrian Democratic Forces (SDF) say they captured dozens of foreign fighters in recent weeks.